The AutoView 1400 KVM switching system includes multi-platform support, advanced cable management options and a convenient on-screen display. Avocent AutoView 1400 (AV1400-001) 8-port, single user KVM switch provides PS/2, USB, Sun and serial connectivity, advanced cabling options, flexible access and a next-generation user interface in one switching solution. 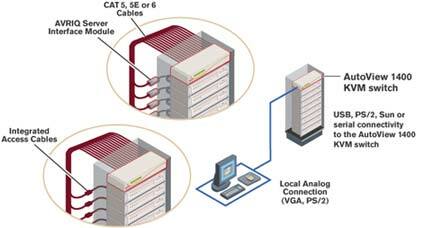 The Avocent AutoView 1400 (AV1400-001) switch server interface modules and integrated access cables automatically assign and retain unique server names, which simplifies installation and eases re-configuration. With flexible cable options and advanced on-screen management, the Avocent AutoView 1400 (AV1400-001) switching system is an ideal solution for today's small office and mid-sized business networking environments. Integrated access cables offer PS/2 or USB keyboard, video and mouse connectivity in one, slim CAT 5 cable, which reduces cable bulk, saves time and reduces cost. Provides access to eight PCs and network devices. Question: Is this device network capable?